Knowing how to manage your account and load money onto your card makes paying with PRESTO easier and faster. 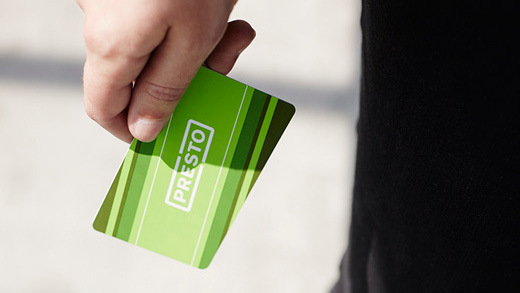 *Good things take time – if you purchase a PRESTO card from Shoppers Drug Mart or a Transit Agency outlet you’ll need to wait up to 24hrs before setting up a My PRESTO Account or load funds or passes online. The Autoload feature reloads your PRESTO card automatically when your balance drops below a dollar amount which you choose. Sign in to your online account and set up Autoload by using a credit or debit card. Activate Autoload by taking a regular trip with your PRESTO card, or by tapping your card to a Balance Checker machine. Remember to activate your card 24 hours after setting up Autoload and within 30 days. Remember that online loads may take up to 24 hours to process. That’s because the information needs to get transmitted to all of the PRESTO machines, and there’s 8,000 of them across the region. After loading online, you must activate the load on your card. Wait 24 hours and then tap on a Fare Payment machine or Balance Checker machine within 30 days. To save even more time, set a default trip. To learn how, click here.